Here is good news for the Pakistani Nationals that OPF Overseas Pakistani Foundation Jobs 2015 NTS Form Sample Paper & Last Date are available to apply. Jobs in Overseas Pakistanis Foundation working under Ministry of Overseas Pakistanis & HRD Government of Pakistan are available and department is looking to hire staff under the quota of Punjab, Sindh and KPK for its offices in Islamabad, Karachi, Lahore and Peshawar. 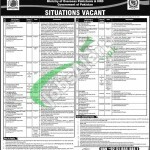 Applications are invited from the suitable candidates who possess relevant qualification and experience as per the criteria given below for the vacant positions such as (Director General, Director OPF, Additional Director, Assistant Director, Law Officer, Welfare Officer, Office Superintendent OPF, Assistant Editor, Office Assistant, Telephone Operator, Stenotypist, Accounts Assistant, Clerk / Typist OPF, Driver and etc). OPF has authorized NTS to conduct recruitment test for the above mentioned vacant positions and every candidate has to pass NTS test for to qualify for interview. Candidates may download application form and deposit slip from NTS official site. Duly filled application form along with of copy of NIC, two recent passport size photographs and original paid deposit slip as test fee should reach NTS Headquarter whose address given below. Last date for submission of application is 12th July, 2015. Sample papers will be available at the official site of NTS. NTS Test date is not announced yet but it will be available soon at the official site of NTS with Roll Number Slips. Last Date to Apply: 12th July, 2015. Address: NTS Headquarters, 1-E, Street No. 46, Sector I-8/2, Islamabad.